Budget hotel in Udaipur with tariff, Cheap Hotels, Book hotel in Udaipur online, near railway station and bus stand. 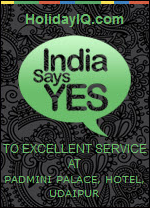 Book Hotel in Udaipur, Pay online for best discounts and tariff. 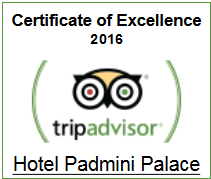 Padmini Palace is best budget hotel in Udaipur. Well appointed and conveniently located near railway station, bus stand and Gulab Bagh Garden, with just 5 mins walking distance from the famous lake pichola and city palace and just a stone throw away from the prominent shopping places. It is ideal for a comfortable stay, both for leisure as well as business travelers. Udaipur, set in lush green valley, surrounded by the hills of Aravallis and interspersed with translucent lakes, Udaipur has been more favoured by nature than most of its desert neighbours. It is situated in south of Rajasthan about 425 Km from Jaipur. Udaipur is well-connected by rail, road and air from all the major cities of the country.